The advanced reading for Q2 2018 U.S. GDP will be released on Friday at 12:30 pm GMT. And that means that there’s good chance that the Greenback may get a volatility boost. Oh, for the newbies out there, the U.S. Bureau of Economic Analysis (BEA) compiles and releases the official U.S. GDP reports. And they come in three flavors: (1) the first or advanced estimate, (2) the second or preliminary estimate, and (3) the third and final estimate. And the GDP report scheduled for release tomorrow is, as the title says, the advanced or first estimate. The advanced estimate is often revised as new data come to light, but it does give forex traders and decision makers the first ever glimpse on how the U.S. economy fared, so it usually triggers a reaction upon release. And it just so happens that I have an Event Preview for it. The advanced estimate for U.S. Q1 GDP growth was released way back on April 27. And it revealed that U.S. Q1 GDP grew by 2.3% quarter-on-quarter annualized, which is a faster rate of expansion compared to the +2.0% consensus. However, it’s still a weaker reading compared +2.9% increase reported in Q4 2017. Moreover, Q1 2018’s reading is the weakest quarterly growth in four quarters. Looking at the details, the weaker reading in Q1 was due mainly to weaker consumer spending since personal consumption expenditure only increased by 1.1% (+4.0% previous). 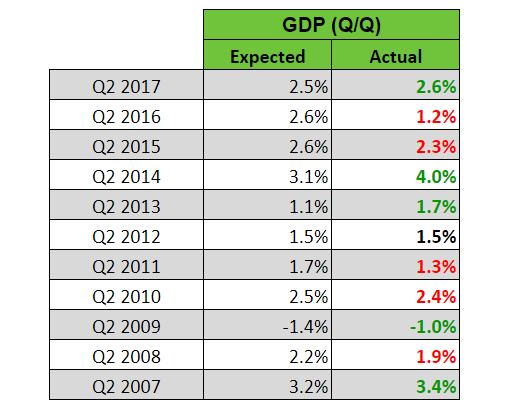 Other than consumer spending, weaker private fixed investment growth (+4.6% vs. +8.2% previous) and weaker exports (+4.8% vs. +7.0% previous), as well as weaker government spending and investment (+1.2% vs. +3.0% previous) were also drags to overall GDP growth. In other words, the details weren’t really too good. And the disappointment doesn’t stop there since the GDP price index came in at +2.0%, missing expectations for a stronger +2.2% reading. Anyhow, the better-than-expected reading for GDP growth caused the Greenback to jump higher as a knee-jerk reaction. However, the would-be rally was quickly faded since the details of the report weren’t as upbeat and the GDP price index failed to meet expectations. What’s expected for Q2’s advanced GDP report? Most economists forecast that U.S. GDP expanded by 4.3% quarter-on-quarter annualized in Q2 2018, accelerating significantly from Q1 2018’s final GDP estimate of +2.0%. In addition, the GDP price index is also projected to come in at +2.3%, a tick faster compared to Q1 2018’s final estimate of +2.2%. There’s therefore a consensus that the U.S. economy improved overall in Q2 2018. Retail sales for all of Q2 2018 is 1.91% more compared to Q1 2018, so consumer spending will likely have a much bigger contribution to GDP growth. Trade is still incomplete because the data for June has yet to be released. But so far, the available trade data for April and May point to a smaller trade deficit in Q2, so it’s likely that net trade will be less of a drag in. The trade reports show that imports of capital goods seem to be increasing, which point to stronger business investment. However, building permits issued were 3.15% less in Q2 compared to Q1 and there were fewer housing starts in Q2, thanks to the 12.3% slump in June. Moreover, overall inventory levels seem to be lower in Q2 compared to Q1, which may also put a dent on the business investment component. Well, it’s not a complete picture since the relevant reports for June have yet to be released. The PCE price index does not always follow CPI, but CPI increased further by 0.1% month-on-month in June. Housing prices, meanwhile, increased by 0.2% in April and May. First up is the Atlanta Fed’s GDPNow. And as of July 18, it’s forecasting that Q2 GDP grew by 4.5%, which is faster than the consensus for a 4.3% rise. The Atlanta Fed cited stronger “real consumer spending growth and second-quarter real private fixed investment growth” for their upbeat forecast. The New York Fed’s Nowcast, meanwhile, is much more pessimistic since it’s forecasting a +2.69% growth rate as of July 20, which is way below the consensus. And a brief look at the New York Fed’s model shows that the New York Fed thinks that consumer spending didn’t rebound, despite the stronger retail sales in Q2. Also, the slide in building permits and housing starts were major drags. As for Moody’s Analytics, it’s forecasting a 4.0% rate of expansion as of July 23, which is a robust projection but slightly below consensus. Moving on, what do historical tendencies have to say? Well, there is a historical tendency for Q2 GDP growth to be stronger compared to Q1 GDP growth, which is in-line with consensus. Take note of the string of weaker readings from 2010 until 2013, though. As to how economists fared with their guesstimates, well, they have a mixed record, so there’s no historical tendency for us to exploit. As for the GDP price index, that tends to print a weaker reading in Q2, which is contrary to expectations. However, there have been more instances of stronger readings in recent years. With that said, economists also have a mixed record for their guesstimates. To summarize, the available GDP components showed that consumer spending was stronger in Q2 and that trade will likely be less of drag, while private investments present a mixed picture since residential fixed investment likely took hits while higher imports of capital goods point to stronger business investment in equipment. Consumer spending accounts for the bulk of U.S. GDP growth, however, so the available GDP components seem to point to stronger GDP growth in Q2, which supports the consensus view. As for the GDP price index, the available components point to a stronge reading in Q2, which is also in-line with the consensus view. Sadly, historical tendencies don’t really offer any meaningful insights this time around since economists have had a mixed track record for both GDP growth and the GDP price index. Anyhow, do note that traders used to react based on how the actual reading for GDP growth compared to the consensus reading. However, the GDP price index has been garnering more attention in recent years since it is more directly linked to rate hike expectations. And the follow-through selling in the wake of the Q1 GDP report is an example of this. Another example is the Greenback’s reaction to the advanced Q2 2017 GDP report since the reading for GDP growth back then was better-than-expected but the GDP price index failed to meet expectations. And as you can see in the chart below, sellers eventually won out.